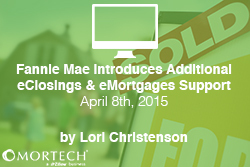 Fannie Mae has introduced new and updated tools on their website supporting eClosings and eMortgages. Tools available on the website include fact sheets, updated technical requirements, and updated FAQs. Additional material including vendor lists and myths about eClosings and eMortgages will be coming soon. An eClosing is a hybrid process where certain documents may be printed to paper and signed but other documentation is created and signed electronically. An eMortgage is an eClosing that includes an electronic promissory note. Fannie Mae is promoting the use of eClosings and eMortgages through these tools due to the efficiency and transparency that an electronic file can provide to the consumer and the cost savings it can provide to the lender. With electronic files, lenders save money with reduced paper and storage costs. The post-closing process is also more streamlined, eliminating the need to scan documents. According to an article by Jeff Bounds on Fannie Mae’s Housing Industry Forum last year, going ‘paperless’ could amount to $1 billion in savings annually, or $1,100 in savings per mortgage. The industry has been slow to make the paperless move even with these savings due to issues surrounding compliance and production. With the work of the Mortgage Industry Standards Maintenance Organization (MISMO), who has created technology standards for secure and efficient exchange of information within the mortgage lending realm, along with eVault services that can process and store electronic mortgage documents, paperless mortgage may start to become more of a reality.